Director David Ayer is the type of artist who likes to share his work process with fans, as he quite frequently tweeted out behind the scenes images from his last film Fury. He's starting to do the same with Suicide Squad, offering up yet another look at his workspace today, which gives us a few more hints about this upcoming DC Comics adaptation as it quickly moves towards its shooting date. It was previously rumored that Suicide Squad would be working under the production title Bravo 14. A prep schedule issued on January 28, just this past week, confirms this to be true. Sitting on top of these work papers is the first volume of The New 52 Suicide Comic. This has surely influenced David Ayer as he continues to write the screenplay, but it's unclear by just how much. 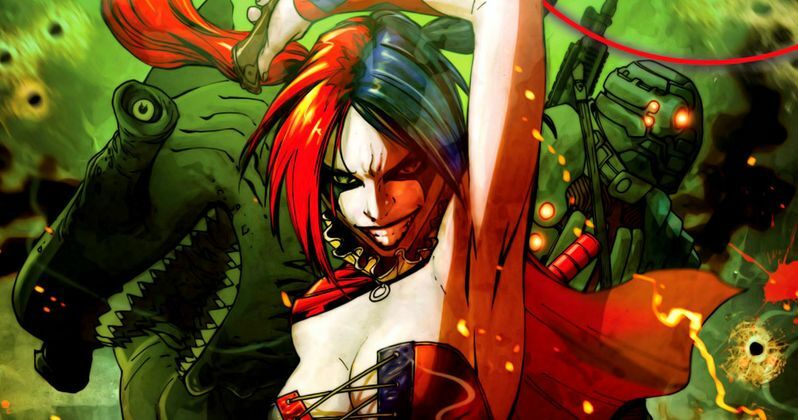 This particular issue of the Suicide Squad focuses on Harley Quinn, and serves to develop an interesting relationship between her and Deadshot. It's not known how much of that will actually wind up on screen when the movie opens next year. Margot Robbie, who plays Harley Quinn, and Will Smith, who plays Deadshot, will actually play ex-lovers in the upcoming Warner Bros. movie Focus. They'll surely be bringing some of that chemistry to this DC Comics adventure.